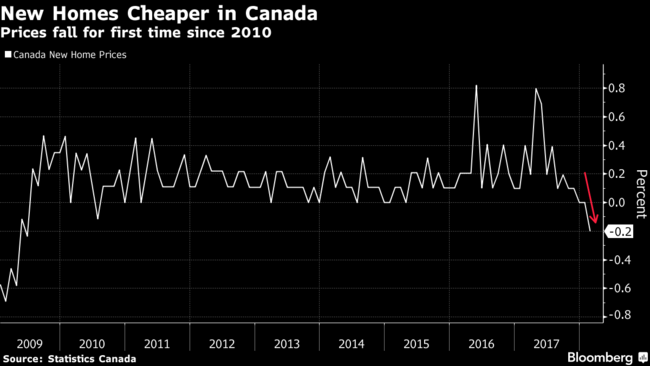 The most extreme bubbles get deflated first, and Toronto’s housing market is likely a bellwether for what is to come in the US and is already set to start impacting the rest of Canada. Only 10 years removed from the subprime collapse, the “You can’t lose money in real estate” mindset has returned like it never happened. As last-year-April’s average Toronto single-home buyer can attest, as they size up their 38.4% average loss on investment, that’s decidedly not so. Home sales in the Greater Toronto Area (GTA), Canada’s largest housing market, and among the most inflated in the world, plunged 32% in April, compared to a year ago, to 7,792 homes, according to the Toronto Real Estate Board (TREB), a real estate lobbying group. The sales plunge affected all types of homes, even the once red-hot condos. The sales slowdown was particularly harsh at the higher end: Sales of homes costing C$2 million or more collapsed by 64%. The market is freezing up at the top. Prices follow volume. Both types of prices the TREB publishes – the average price and its proprietary MLS Home Price Index based on a “composite benchmark home” – fell from April last year. This is a confusing experience for the real estate industry, sellers, and buyers, since prices have ballooned for 18 years, interrupted by only one brief dip during the Financial Crisis, and the rule has been that prices will always go up and that you cannot lose money in real estate.